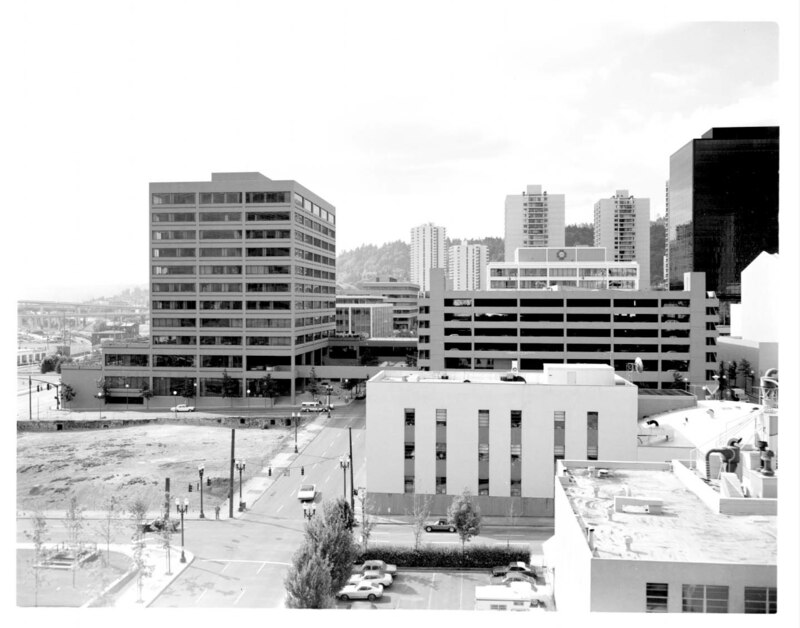 Standing atop the parking garage at SW 1st and Jefferson, we get a good view to the south and a changing Portland skyline of 1975. Newer buildings south of Clay are still standing today, while those north of Clay have been replaced. Notice the tunnels leading under the street where the Marriott Hotel site is being excavated. Anyone know what those vault looking holes are on the south wall of the vacant lot are? I’m wondering if those “tunnels” were actually window openings at one time. Does anyone know if an early grading project affected this area? If the street grade was raised at some point, it would help explain the holes. My guess is those were into vaults under the sidewalk, used to move items into and out of the basements of the old buildings there. There would have been metal doors in the sidewalks over the vaults. Eieher that or light wells, with glass blocks in the sidewalk. There are still sidewalk elevators in Portland as well as sidewalk stairs but in those cases the basement extends under the sidewalk. That does not look like the case here. Those openings do not look big enough for someone to walk through. On the far right of the photo a building has dust collection system on the top of the roof. Anyone know what business was located here? A wood shop? Metal shop of some sort? The previous building on the SW corner (above the tunnels/holes) was the Cour D’ Alene building. The linked VP photo doesn’t provide any clues that I can see as to the reason for the underground features seen in today’s post. Interesting that the building on the southwest corner of First and Clay was demolished and replaced with a surface parking lot. It appears fairly modern and would have fit in well with it’s new corporate neighbors. I wonder if those tunnels are still there under Clay street, what a thrill it would be to explore them! Mike- That filter system is on the Boyd’s Coffee building. They tore down the 1881 Ladd block (parking lot on corner) nearly overnight, for a new warehouse. Even though the city actually “strongly recommended” it be saved. The building was never built, Boyd’s Pulled out of downtown, another beauty lost, and I still will not buy their coffee. Look at how sparse the traffic is. I am sitting in the building now. (The Crown Plaza seen beyond the vacant lot.) In fact my office faces the hotel now so it’s visible in this shot. I certainly wasn’t there in 1975, the year I was born! I wonder if any of those openings in the south wall of the excavation led to former extensions of the Shanghai tunnels. This is pretty close to the waterfront.